Invented by Hungarian mathematicians, the Gömböc can't ever be kept down. It's the world's only artificial, self-righting shape. There are plenty of things that come back up after being knocked down. Angry roadies do, for example. But they get up under their own power. Weebles and inflatable clowns do. But they only manage it because they're weighted. A heavy weight is placed in the curve at the bottom of the toy, while the long shallow curve on its side is light. The heavy weight overbalances the toy and pulls it upright. The Gömböc doesn't have any power, and is a consistent weight all the way through. It has a wide curve on the bottom, surrounded by flat-ish sides and a ridged curve of a top. No matter how it's placed on a flat surface, it will right itself. 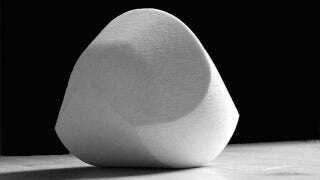 It's what's called a mono-monostatic shape, and was born of mathematical theory. The theory stated that a self-righting shape was possible, and that it had one stable point of balance, and one unstable point. Placing it on the curve on its top will let it pick itself up quickly. Placing on its flat side starts a slower process. It rolls back and forward slowly, then slows almost to a stop, then rolls back and forward quickly in a tiny vibrating motion, and then falls onto its stable point of balance, righting itself again. Gömböcs are not much to look at, and seem like they could be children's toys. Don't try to buy one, though. They're actually upwards of a thousand dollars each. They may look like they were knocked together in a toy shop, but the different angles and proportions have to be measured to within ten microns – one tenth of the thickness of a human hair - to make the shape work. So it's unlikely anyone will get to use one as a paperweight. ETA: Falsidical has located Gömböcs for the low, low price of 169 euros! It's practically a gumball machine prize. Via Plus Maths and Wired.